Carl & OAK Bespoke (Singapore) offer shoes for smaller sizes feet of men & even for ladies looking for lace up leather brogue shoes. We offers sizes from 38, 39 to 46. Men’s shoes smaller than a 40 are considered small size shoes. There’s little on offer from off-the-shelf racks, but Carl & OAK Singapore can provide options. If you’re a man who wears a size 38 to 39 shoe, it can be difficult to find a pair. Just as it can be hard to find men’s clothing in smaller sizes, it can be even more difficult to find small–sized men’s shoes. While most stores offer only medium sizes, Carl & OAK Bespoke has the ability to offer extended sizes for you. Timeless oxfords and leather brogues get a modern twist with fringing and cut out details making them the perfect shoe for the women. Manly shoes for the modern girl. Give your style a dose of androgynous finesse with some women’s brogues and lace-ups. Sensible but super stylish, these shoes are a favorite on the catwalk. Office brogues. 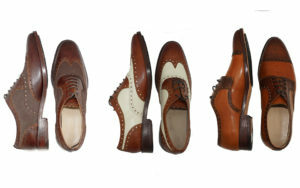 Brogues, now worn by both men and women, the ever-practical brogue was originally adopted by Scottish and Irish farmers.